Funeral Home Resource, the online marketing department for funeral homes, announces its relocation to Austin, Texas. "A move to Austin allows Funeral Home Resource to take advantage of the dynamic business and human resources available to technology companies, supporting the company's rapid growth," says CEO and President Ron Browning. Funeral Home Resource, the online marketing department for funeral homes, announces its relocation to Austin, Texas. Austin, a city of burgeoning technology and innovation, is a perfect match for Funeral Home Resource, a high-growth company innovating marketing strategies for the funeral industry. "A move to Austin allows Funeral Home Resource to take advantage of the dynamic business and human resources available to technology companies, supporting the company's rapid growth," says CEO and President Ron Browning. Austin's robust and diverse technology industry has made it a true center for technology innovation. Quality technology hires coupled with the city's tax friendly structure offer Funeral Home Resource advantages not available elsewhere. The local support for emerging businesses allows Funeral Home Resource to leverage its success in SEO and referrals to funeral homes and cremation providers to its burgeoning business-building platforms. 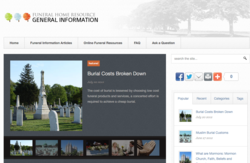 The new platforms include funeral information sites and sites for free cremation quotes. Funeral Home Resource neighbors technology companies in Austin on North Mopac, bordering Texas' beautiful hill country. Funeral Home Resource, the outsourced online marketing department for funeral homes, grows market share for funeral homes through on-line marketing to families in need of funeral home and cremation services. Funeral Home Resource operates FuneralHomeResource.com, the premier on-line directory of funeral homes. FHR is trusted by the most established, most respected names in the funeral industry, handling all their online marketing efforts and overseeing the creation, capture, delivery, and conversion of thousands of online inquiries for them each month. Funeral Home Resource specializes in no-risk performance marketing arrangements.